Udipi Cafe was actually Thomas’ find, though I had seen it listed on happycow.net before. We were heading over to Tate’s comics, which is just a little north of here, and he went through the trouble of looking up some veggie places that were close by. It’s a good thing he did, because we were starving. When we walked in, it was around 5, and it was clear that we were some of their first dinner customers for the day. This actually worked in our favor because the host/waiter was able to take time to discuss the menu with us. Udipi is ENTIRELY VEGETARIAN. I noticed that some of the entrees on the menu were clearly marked vegan, but it was harder to discern what else was from the rest. He helped to explain the menu, but after figuring out our main dishes, we were still at a loss for an appetizer. If you’re not really familiar with Indian food, the descriptions are not enough to go on, because a lot of them sound similar. We decided to go with the sampler. He explained that it came with paneer, and I said that was okay, as long as he pointed out to me where it was and if any of the sauces were non-vegan. 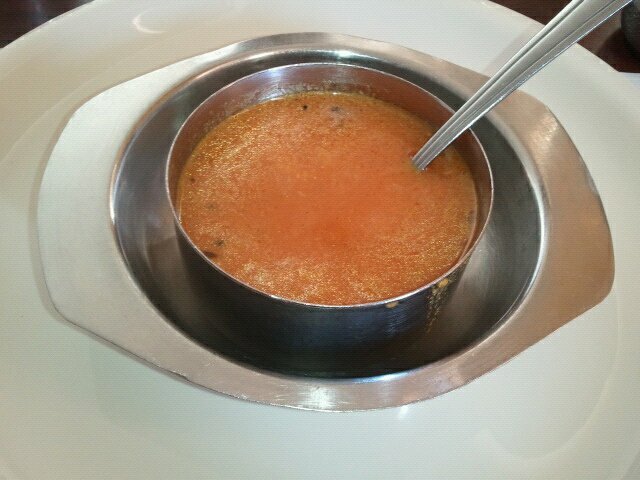 First came this wonderful soup. I don’t really know what was in it, but it was delicious and Thomas’ bowl had a piece of squash! Next came our sampler. 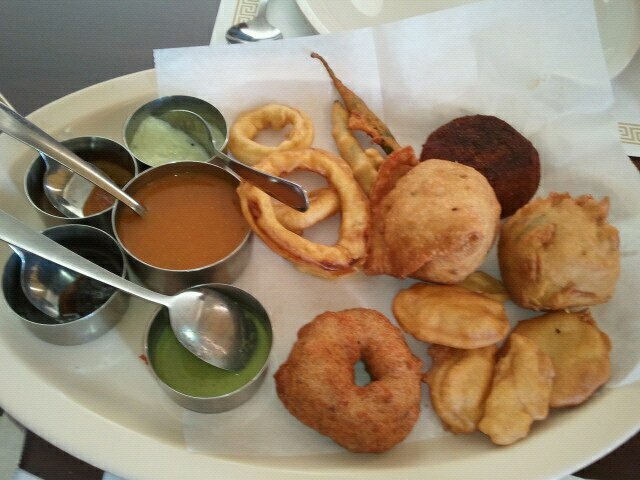 To my surprise and pleasure he announced that they had made a totally vegan sampler for us and skipped the paneer. Again, I’m not sure what everything was but the rings were onions, and the little pieces of bread had slices of potato. The long skinny green bean looking ones were actually chiles, and I ate the small one trying to figure it out. I got it when the heat started to build. Thomas ate the larger one, and I guess it wasn’t as spicy. The doughnut shaped one was made from lentils and the big round things and fried cake were the best. The sauces were all delicious. A mint and a coconut, and savory and sweet ones. I’m sorry I don’t know more about it to give you better descriptions, but this trip has piqued my interest. Then came all of our food. Our two entrees on either side of what we figured was a shaved fennel something, because we had a similar “slaw” if you will, at Mary’s recently! It came with an enormous amount of white rice, which I pushed over to Thomas, and I ordered some bread / Chapathy soft, thin baked whole wheat $2.95, not pictured. Both of these dishes were incredible. I really liked the sauce on the left. It was sweeter, but I also really liked mine, and we both love chickpeas, I think we both agreed that they both should’ve had them! hah. We stuffed our selves silly and still had plenty for leftovers. Everything was wonderful and fresh and our server was very helpful and patient.